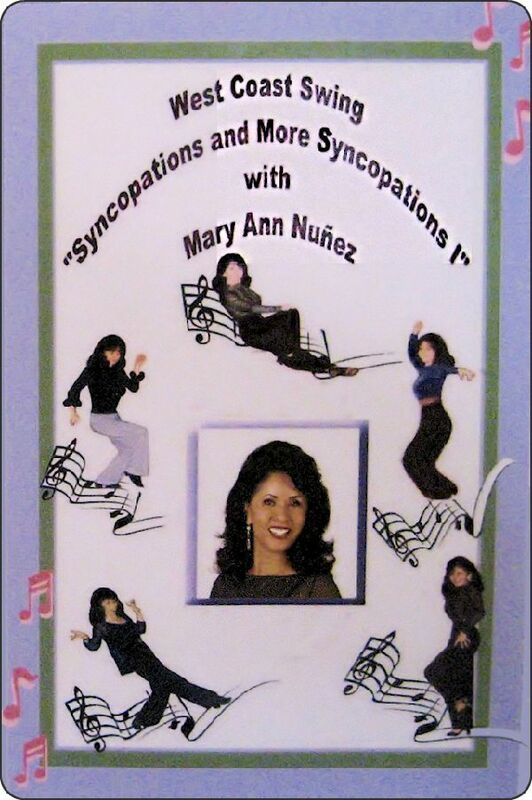 Mary Ann Nunez West Coast Swing Dance 'Syncopations & More Syncopations' Instructional DVD. NOW IN DVD with CHAPTERS FOR YOUR CONVENIENCE ! Syncopations are fun and add a flavor and style to your West Coast Swing dancing as well as being an integral part of the dance. Over an hour of fun and easy West Coast Swing syncopations to some more challenging ones now on DVD for both followers and leaders. This DVD is especially designed to be a partner to my first video "Basics and Beyond." All syncopations will be executed from these basics and done independently. You can follow right along at home as they are being demonstrated in a clear and easy pace with detail on foot placements, rhythms and pointers on connections, with an added feature of slow motion with voice-overs to point out certain details, along with a first-time-ever method displayed on video for a new and easier learning experience. SAVE MORE $: The cost for one DVD is $40.00 / Two DVD's $70.00 / or buy Three for $120.00 and get the 4th DVD FREE. Order this 'Syncopations & More' DVD. Each individual DVD page has a link to order that single video alone or 'Bundle It', such as here. To purchase the 'Syncopations & More' DVD only, click the 'Add to Cart' button below. Save $10: When you Buy Two! Click the 'Add to Cart' button below to purchase the 'Two-DVD Bundle. Please don't forget to type in the titles of your choice of DVD’s in the text box before you click the ‘Add to Cart’ Button below. Save $40: Buy Three DVD's and get fourth FREE! INSTRUCTIONAL DVD Demos/samples ... Click Here!